I don’t do St. Patrick’s Day. Despite the fact that everyone thinks I should be in Riverdance, I’m not Irish. I couldn’t be less Irish. St. Patrick’s Day is the second biggest "amateur night" for going out – right behind New Year’s Eve. Add to that the fact that I don’t drink beer and, well, it’s just another day to me. What I *do* do is bake – to the enjoyment of my friends who all have massive sweettooths. Since chocolate is always a crowd favorite, I decided to spin the typical brownie recipe to celebrate this joyous "holiday". No…I did not make green brownies nor are there any green M&Ms anywhere to be seen. This brownie recipe uses a bottle of Guinness Stout, the King of (Irish) Beers. You don’t really taste the beer, exactly. What you end up with is a fluffy yet gooey brownie that’s full on chocolate with a slight bite at the end. The texture is phenomenal, which I think is caused by the carbonation in the beer. Whatever the reason, these brownies are an excellent way to celebrate – any day. – Preheat oven to 375. Line a 13×9 pan with aluminum foil. – In a medium bowl, whisk together flour, cocoa powder, and salt until evenly mixed. Set aside. – Melt butter, bittersweet chocolate, and white chocolate in a double boiler under low heat until evenly melted and smooth. Set aside. – In a large bowl or mixer bowl, beat eggs and sugar on high speed until light and fluffy – around 3 minutes. Add melted chocolate & butter mixture to eggs, beating until combined. – Beat reserved flour mixture into the liquid ingredients. Whisk in beer. The batter will seem thin – its supposed to be that way. Drop in semi-sweet chocolate chips. – Pour mixture into pan and bake for 25 to 30 minutes or until toothpick inserted into center comes out clean. Let brownies cool to room temperature and dust with confectioners sugar, if desired. I’m like you- I don’t do St. Patrick’s Day, but these brownies look good enough to change anyone’s mind. On a side note-your hair looks great! I’ve never seen a brownie recipe with beer.It has to be good. Very interesting Tami! I don’t drink beer either, and even my Irish hubbie does not. However all his family members do, so I should impress this with your recipe. Merci! Tami, that is cool. I’m not a huge brownie person myself, but my wife loves them. I may just have to give these a try. Couldn’t agree with you more about St. Patrick’s Day, but I do love my beer. And beer as a secret ingredient in brownies sounds awfully good to me. 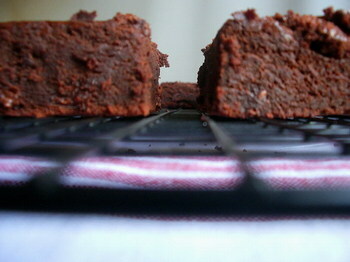 These brownies are like a fudgy version of the Chocolate stout cake on epicurious.com, but much easier to make. Thanks for the recipe! True chocohol bakers might also enjoy the bourbon brownies on cookinglight.com Ahh, these brownies brought me back to my college days, when I would order the stout at Rock Bottom Brewery and they served it with a brownie.